When designing the two conference rooms – ideally suited for holding congresses, seminars, meetings, exhibitions, press conferences, company celebrations and private functions in Vienna – Sir Terence Conran + Conran & Partners used a skilful blend of design disciplines to create a superb setting for every kind of event:A stylish lighting concept ensures the right lighting level for every room at this conference hotel in Vienna. Its interiors are characterised by timeless modernity, while the latest conference technology ensures every event will go smoothly.In summer the leafy courtyard is available for small-scale functions, such as cocktail receptions or aperitifs for special occasions. 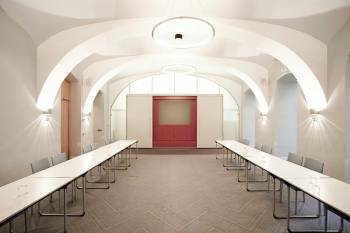 During breaks in seminars, business meetings or conferences attendees can relax outside in the fresh air.Overlooking the courtyard, the salon of this conference hotel in Vienna is the perfect choice for small meetings, which can be held in one of its three lounges. At larger events, this area is also suitable for staging stand-up buffets, receiving guests and serving cocktails.